If you have a Google Calendar account then you might want to try our 2-way synchronisation with Google Calendar. This means that all of your Google events and appointments will appear in your You'reOnTime Calendar and vice versa. Please note that if you wish to make changes to your You'reOnTime schedule that this must be done via You'reOnTime as it will check for scheduling conflicts. The same applies to your Google events, if you wish to make changes to these event it must be done via Google Calendar. In the Calendar Setting screen, make sure the Country settings are the same as the Country settings in your You'reOnTime account and most importantly make sure the Your current time zone is the same in your You'reOnTime account. After confirming the settings are the same, click the Save button on your Google Calendar Settings screen. 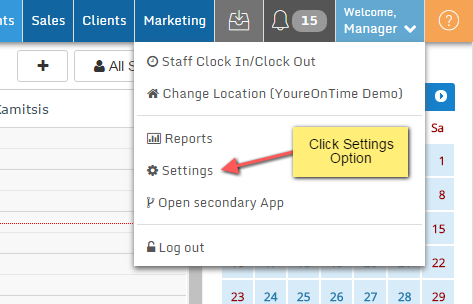 Note: Your You'reOnTime account Country and Timezone settings can be found in Settings --> Account Business Details --> Business Settings --> Business Details section. Let's start, login to your You'reOnTime account. 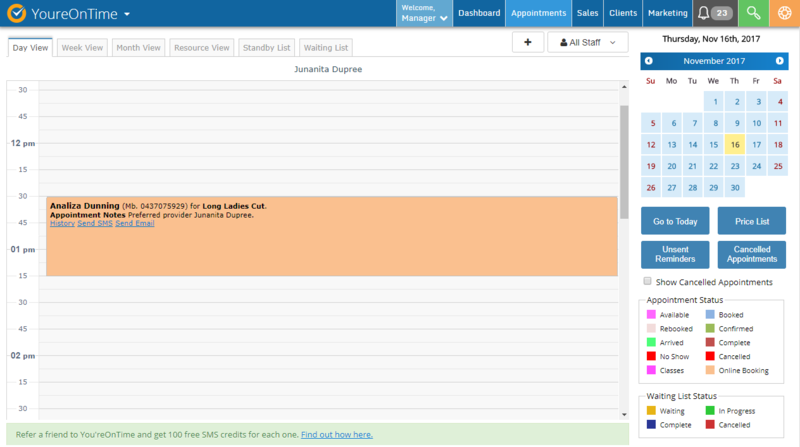 Click on your Appointment screen to see which appointments you have today. In the below example from our Demo site, it shows that Betty Boo has an apointment with Analiza at 12:30PM on the 16th of November 2016. When in the Google Calendar Sync screen click on the Sign in with Google button to link You'reOnTime to your Google account. To send your You'reOnTime appointments to Google Calendar, tick the Send appointments to Google Calendar checkbox, then select which Calendar to send the appointments to. We recommend creating a new calendar in Google specific for You'reOnTime to send your appointments to. To load your Google Calendar appointments to You'reOnTime, tick the Load events from Google Calendar checkbox and then select which Calendars to load. To perform the two-way synchronisation simply chick the Synchronise Now button. Now return to your Google Calendar account, click on today's date and you will see the appointments from You'reOnTime have now been imported to your Google Calendar. A message box will appear informing you that the Synchronisation has started. This means synchronisation is running in the background and will be completed shortly. The next time you click on the appointment screen, your Google event that was added in Google Calendar will now appear on your You'reOnTime scheduler.